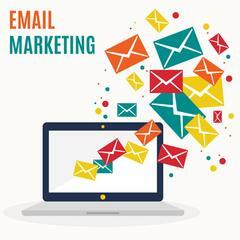 Best Practices - Email Marketing that builds a Trusted Relationship with Your Customers. When we ask our clients, “Do you have a list of email addresses for your customers” The answer we receive is often, “sort of, but I'm not doing much with them".....and we reply with, "You have won the battle and have their email, but to win the war, you need to strategically email them with offers and information about your company. The email has one or more links that directs them back to your website to read more, claim offer, redeem coupon, etc. You are building a trusted relationship and not spamming them. Offer a referral bonus, or a friends and family coupon offer. With emails you have a direct line to a potential new customer or your current customer. These customers have indicated that they have some interest in your services. When you send them a high quality email once a month that directs them back to your website you are building a trusted relationship with them. A trusted relationships will do several things. When they are in need of cleaning or restoration services, they will consider your company. If they have a friend or family member in need of cleaning or restoration services, they can easily forward the email. If you want to stop paying for leads? Start building a trusted relationship through email.